The key in addressing mixed audiences -- in dealing with the obvious variations in expertise -- is structure. From top to bottom -- from the individual sentence to the overall structure. You must distinguish between the information you give to the audience as a whole and what information you give to a select part of your audience. The needs of the select will differe from the needs of the whole. You will need to structure your writing or speaking accordingly. At the overview level -- taking a view of teh whole presentation or document -- it is helpful to structure the content in levels of increasing specialization. Almost like in a pyramid form. Reports or papers customarily start with an abstract and an introduction (first level). Then providing more detailed information in the report or paper itself (second level), then possibly segregating in appendices what even fewer readers will need or want (third level). For a document such as a report or paper, place first what everyone needs or wants to know, typically in a summary or abstract (first level). Provide more detailed information in the report or paper itself (second level), possibly segregating in appendices what even fewer readers will need or want (third level). 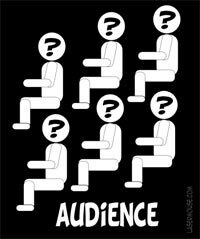 For a presentation to both specialists and nonspecialists, and especially when your time is limited, aim for the less specialized audience members in the presentation itself (first level). This will undoubtedly lead to further questions from the more specialized crowd at the end (second level). So you should mitigate for that fact. You could even create a companion document with more detailed information (third level). Feel free to include more specialized moments in the presentation itself, so you can hint at your deeper understanding, but make sure that these moments do not prevent less specialized attendees from understanding the remainder of the presentation. We have opted for connectors made of gold. Gold exhibits both high electrical conductivity and excellent resistance to corrosion. We have opted for connectors made of gold, given its high electrical conductivity and excellent resistance to corrosion. In this second version, the properties of gold are not presented as an independent fact but as a justification for the choice made. The new, compound sentence is more interesting for all readers, yet no information is lost for the less specialized ones.